I finally made it to Publix after multiple attempts since last Thursday. I apologize for the photo but I was rushing since Justin was standing next to me waiting to grab the red potatoes and start prepping them for our dinner. We had them with the salad pictured above and feta cheese stuffed Zaycon chicken. So good! I would have skipped Publix all together this sale cycle but I really wanted to take advantage of the really cheap Buitoni and Fresh Express Salad deal. While I was there I also grabbed cheap feta cheese, cheap veggies, and a surprise BOGO deal on snack packs of Pirate's Booty for my lunches. 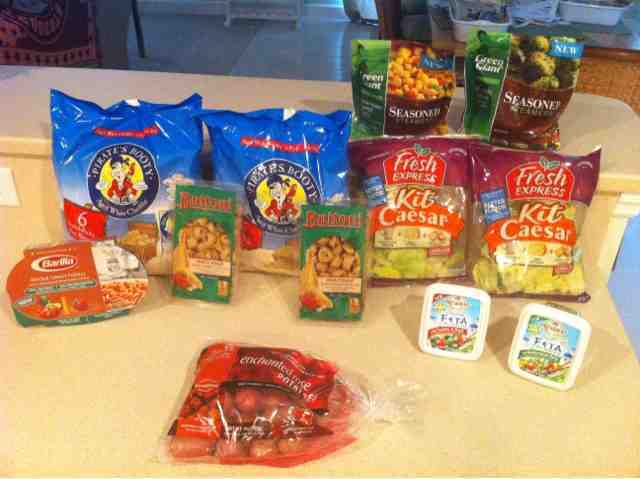 I hit right around $31 before coupons so I was able to use a $5/$30 Winn Dixie coupon. I had a brief moment of panic because I thought I didn't have one with me since I wasn't planning on spending $30 before coupons today (I didn't know about the Pirate's Booty deal). I could not believe that with stacks of them at home from a past Enjoy the City stock up, that I wouldn't have a single one in my couponing bag. Luckily there was one hidden in my wallet which helped me save over 75%. Weather permitting I do hope to finally get back on track with my regularly scheduled Thursday shopping trips this week and I should be back to having my usually weekly totals link up post on the blog by Friday morning. Don't forget to enter my $25 Publix gift card giveaway before it ends on Friday night!